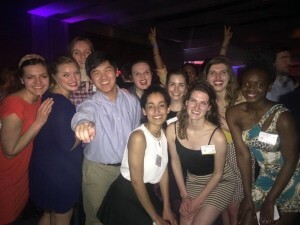 Last night, the “Delegate Dance” event took place at the Marriott Copley Place. The main purpose of the dance is to give everyone the opportunity to see a different aspect of other delegates out of the committee session. We may not all like the same kind of music or dance the same way, but sure we all enjoyed last night’s closing party! It all began at 9 p.m. when people started gathering on the fourth floor, even though the party was set to begin at 10 sharp. The expectations were high. After five committee sessions with an exhausting debate between countries, everyone was looking forward having a couple of drinks with both allies and opposition. The party itself lasted 3 hours because of the hotel’s policies. It was extremely amazing. People did not want to go back to their rooms and you may imagine why that was. It was the best closing party. Of course, the conference leaves a bittersweet flavor because just when you are enjoying it a lot and you make a lot of new good friends, everything ends. However, fear not, next year HNMUN will be back in Boston! College of Saint Benedict and Saint John's University's delegation during the party.